At The Anco Inn we are dedicated to making sure that our guests have a comfortable and pleasant stay. We go the extra mile, providing amenities that will be sure to meet your needs. Business travelers will find our wireless Internet, fax and copy machines and conference rooms ideal for their needs. Families on vacation will find the comforts of home, from the rooms featuring fully-equipped kitchenettes to our outdoor pool. We offer both standard and deluxe rooms for our guests, and while you're with us we'll be happy to help find the resources you need, whether you're looking for a taxi, an airport or the local sights. Let us show you firsthand why so many of our guests leave satisfied. 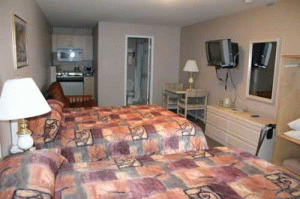 Large and/or connecting rooms available for up to 8 people - great for families! Please visit The Anco Inn Website. Locker room for storage of bicycles, sports/team equipment, etc.